While it’s intrinsically enjoyable to foist all the special moments, e.g., graduation ceremony, wedding, birth of baby, etc. into your HD camcorder but it’s also a kind of torment that you cannot resurface these recorded wondrous memories on your other media players, for instance, your Apple iPad. Because camcorder recorded HD videos are saved in AVCHD format (.mts or .m2ts files) that is not natively supported by iPad. 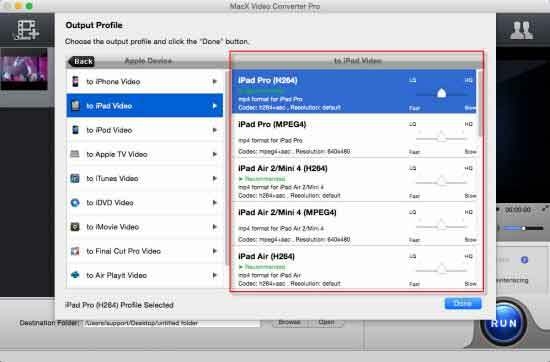 So if you want to play AVCHD MTS or M2TS files on iPad without running into trouble. You’ll need to convert MTS/M2TS to iPad for unrestricted watching. Frankly speaking, to sync your recorded MTS or M2TS videos with your AVCHD camcorder to iPad can be easily completed with assistance of a competent MTS file converter. 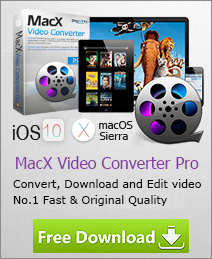 And MacX Video Converter Pro is just designed to cater to your need. This program will enables you to transcode MKV, AVCHD, MOD, MTS, M2TS, etc to iPad Pro/mini 4/Air 2 and other iPads in untouched quality. Best Mac media converter to decode MTS, M2TS, AVCHD HD formats to iPad (iPad Pro/Air 2/mini 4) with the fastest speed and no quality loss! Free download this MTS/M2TS video converter on Mac computer or get the windows version for PC (Windows 10 supported) users, drag and drop the file. Or go to "Add File" button to locate the M2TS/MTS files you want to add. To convert MTS/M2TS to iPad for on-the-move watching, here you can simply select "iPad" as output format. The optimized default settings ensure the best output quality. It supports all types of iPad, including iPad Mini, iPad 4. This utility also boosts an excellent feature of converting MTS to MP4, M2TS to MOV, AVCHD to YouTube compatible format for uploading to YouTube with your family and friends. Click "RUN" button to start converting MTS/M2TS to iPad on Mac. You can view the conversion progress and are able to cancel the process at anytime. After a short period of transition, you can sync it to your gadget and play MTS M2TS files on iPad without limitation. Tips: This camcorder HD video to iPad converter also possesses an excellent YouTube HD video downloading feature, which let you download HD full movies on iPads like a breeze.